It is with great sorrow that I heard the news of Michael Bonds' passing today. 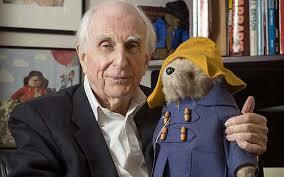 Michael Bond was, of course, the creator of the beloved Paddington Bear. The first book, A Bear Called Paddington was first published in 1958. 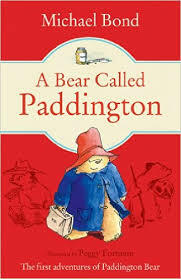 It introduced the world to Paddington Bear, so called because he was found at Paddington Station after having made his way from deepest, darkest Peru stowed away on a ship with a suitcase full of marmalade sandwiches. A Bear Called Paddington, along with the numerous sequels, chronicles the life Paddington is now adjusting to in contemporary London; adopted by the Browns', trying to understand how everything works and causing chaos, while frequently saving the day at the same time. Gentle, poignant, observant and all too human, Paddington stands among the great fictional characters of our time. Bonds' books went on to introduce other characters; Olga da Polga, that marvelous, funny guinea pig who has left the pet shop to start her new life with her human owners;the tales of those classic crime-fighters, Monsieur Pamplemousse and his faithful bloodhound, Pomme Frites and many, many others. 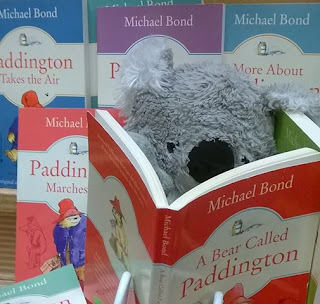 LB Koala dips into books about his hero, written by his other hero. While Bond lived to the splendid age of 91; and a life well-lived, indeed; his presence in this world will be sorely missed. Kind, gentlemanly and utterly charming, there are few that could stand in his shoes. I am ever so grateful for his gift of Paddington Bear, which allows him to live on in our hearts. RIP, Michael Bond....dear afterlife, please look after this gentle, wonderful author. On 26 June, 1997, the first copies of Harry Potter and the Philosophers Stone by an unknown author called JK Rowling greeted the world as bookshops opened their doors....quietly, unobtrusively....almost without notice. It seems strange to think that now. 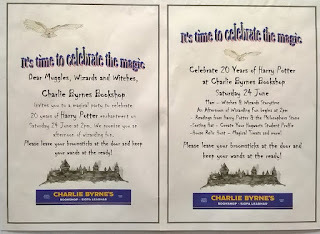 We are so used to having Harry Potter in our lives and no one could have predicted the effect the publication of that book exactly twenty years ago would have. 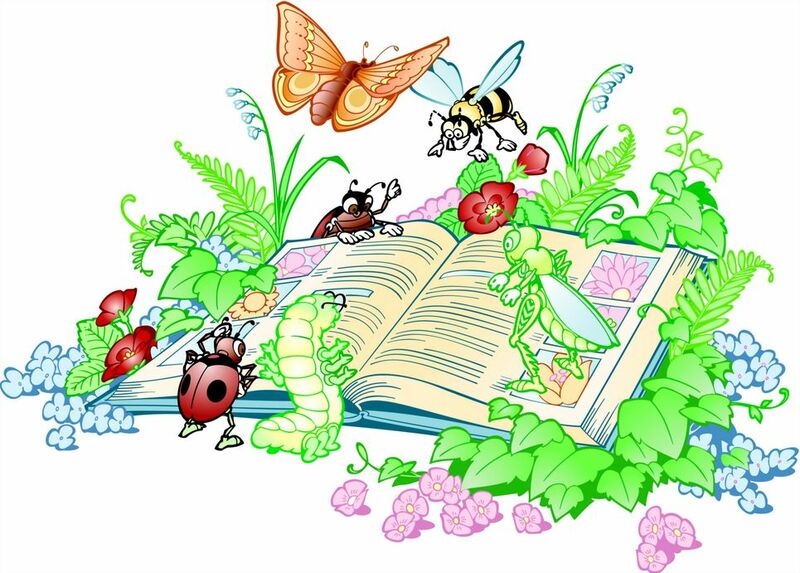 It has changed the reading landscape of children and adults alike. 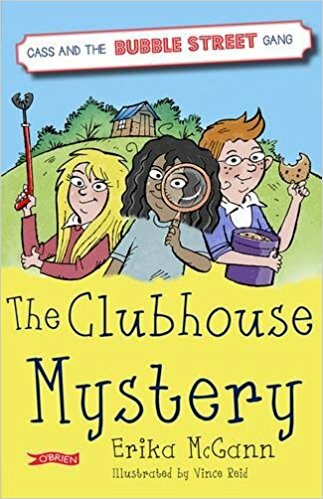 As recent as last week, I found myself shocked as a customer came in to buy a copy for his young son (aged 9 and grinning like at mad thing at the thought of his own copy!) and admitted, "I haven't read it." It wasn't just me...a silence came over the quite full childrens section at that moment and all heads slowly turned to stare. I recovered this awkward moment by saying (sincerely...it's how I really feel); "How exciting for you! You get to read it the first time together...I remember the first time I read it. Magic...just magic!" And it was...it still is. Every time I go back to read Harry Potter and the Philosophers Stone I am consumed by the story, entering that world again. It is so tangible; so filled will texture, so real. This past weekend, there were a lot of celebrations around this twenty year anniversary. Some bookshops have had readings of the first book, chapter by chapter; some have had treasure hunts and parties. Me? 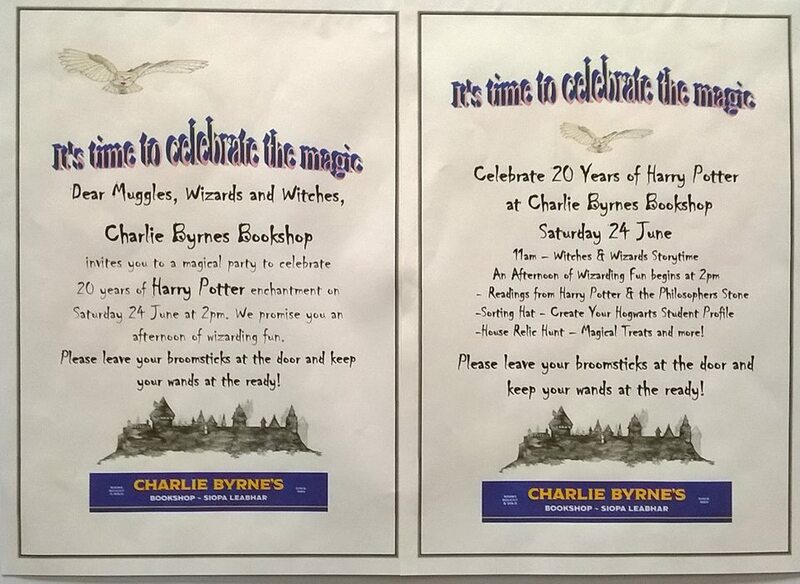 I went the party route at Charlie Byrnes Bookshop. 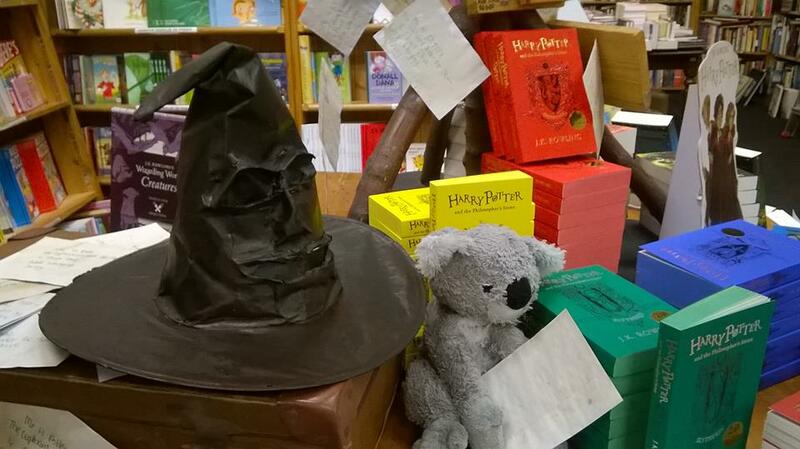 A Witches and Wizards Storytime for the little ones at 11am, shifting into party mode at 2. I read snatches from the Philosophers Stone... Uncle Vernons' growing sense of calamity about to strike in that first chapter is priceless, expressed with such a fantastic finesse that it lulls you into the story. 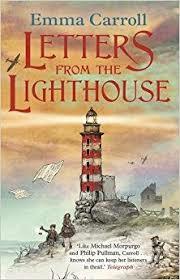 Another favourite that has to be read on the day, of course; the 'escape' from the owls Uncle Vernon plans on Harry's unnoticed birthday to the rock in the middle of a stormy sea; plans that are only to be scuppered by Hagrid's appearance and those 4 words that change everything...."You're a wizard, Harry." 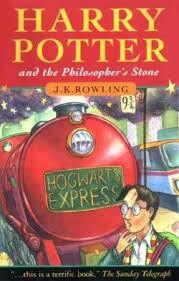 I've often wondered about the first person to buy Harry Potter and the Philosophers Stone. I'm not talking about monetary issues here.) Of course, you would not have known what was going to happen in the upcoming time. As I said, it was quite unobtrusive in it's initial appearance. But, twenty years down the line and I think, wow! Can you imagine being the first person to buy that book? Thank you to Barry Cunningham who was insightful enough to be the first publisher...and the wonderful crew at Bloomsbury. And thank you, thank you, thank you to JK Rowling; you changed everything. Happy 20th Anniversary to Harry Potter. The summer holidays are fast approaching, with most of the teens and young adults here already out of school. They'll need something to escape into, even though it seems at times their reading material is quite serious and issue-driven. Here's a few for that crowd, which will peak their interest and keep them reading. 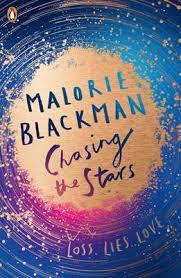 Chasing the Stars by Malorie Blackman is an amazing, intriguing science-fiction re-telling of Othello. Twins Olivia and Aidan are heading back to Earth on their own after a virus has wiped out the entire crew of their vessel. Nathan is on board a ship heading in the other direction when it is brutally attacked, with few survivors. For Olivia and Nathan, it is love at first sight. But their love inspires jealousy, deception and hatred in the others. A gripping, consuming read from the incomparable Blackman. I have already praised Released by Patrick Ness (see the Young Adult review page) and all I can say now is, please, please read this book. A personal, in fact intimate story that covers one day in the life of Adam Thorne. But it is the one day when everything changes; when it all falls apart. If I could put this into everyone hands (literally) I would do so. No one writes like Patrick Ness. 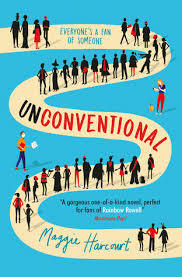 Unconventional by Maggie Harcourt is Lexi's story. Lexi who has lived most of her life behind the scenes on the sci-fi/fantasy convention circuit with her Dad and has now become his right-hand. Clipboard in hand, she runs the show, while in her off hours is up to her eyes in course work. The last thing she needs to fall in love...with her favourite new author. Quirky, funny and touching. 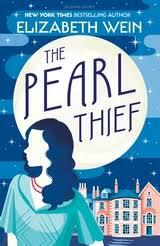 The Pearl Thief by Elizabeth Wein steps in as a prequel of sorts to her earlier (incredible) work, Code Name Verity. Set in the summer of 1938, this Scottish, Agatha Christie-style murder mystery, Julie goes home to the beautiful Strathfearn estate for one last summer. An unlikely, oddly connected chain of events; a vicious riverside attack, the disappearance of a noted academic and the theft of her grandfathers' collection of river pearls; changes, not only the tone of the summer, but the lives of all in the small village...for all time. Exquisite historical fiction meets coming of age. With so many 'popstar music' reality TVshows taking up so space on our channels, the interest is clearly already there. Sheena Wilkinsons' Street Song adds the actual reality and some definite food for thought. Ryans' short lived fame as a winner of Irelands' PopIcon show, left him with an addiction problem and all the wrong kind of tabloid press. Out of rehab, Ryan, now 18, is left struggling to rebuild his life. His overbearing, uber-controlling (ex-manager) stepfather presses Ryans' buttons in all the wrong ways. One night, after a particularly bad and violent argument, Ryan finds himself on the run from Dublin to Belfast with a new name, in search of a new life. This is gritty, realistic stuff and it is brilliant. 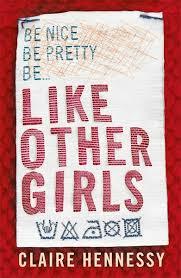 Following the wonderful Nothing Tastes As Good last year (with its' intriguing dead narrator), Claire Hennesseys' Like Other Girls tackles another set of present, sensitive issues faced by many young women today without succumbing to sensationalism or moralising. In St Agnes' School, everyone is expected to be a perfect young lady in every respect. But Lauren isn't like other girls, and she knows it. She stands out; her heart is broken; her boyfriend thinks she's just nuts; her bestfriend has soooo many issues of her own. Lauren is angry, catty, confused and in pain. And now, Lauren is facing every girls worst nightmare. 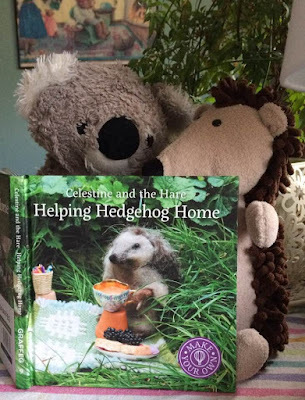 Written with compassion, understanding and a truly genuine voice, this book is real! 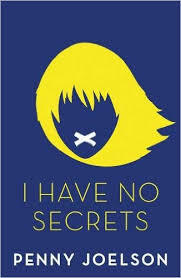 I Have No Secrets by Penny Joelson defines the term 'compulsive read'. Jemma is 14 and has severe cerebral palsy; and she makes a truly unique narrator. Unable to communicate, Jemma finds herself in the unique position of being the one person that people feel they can confide in. She knows many of their secrets. They all assume Jemma is unable to understand. But one day, she learns a truly horrific secret. Jemma watches and a nightmare unfolds before her and is powerless to do anything. But maybe that's all about to change. A book that will intrigue, enlighten and, perhaps, change your perspective. In Spellbook of the Lost and Found by Moira Fowley-Doyle, Olive and her friend, Rose notice they are losing things...small things, really. A hair-clip here, a bit of jewellery there. But it soon becomes evident that Rose has lost something much more valuable. And she doesn't want to talk about it. 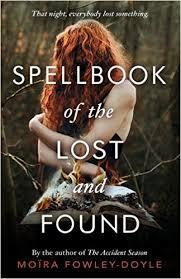 A chance meeting with three other girls leads to the discovery of an ancient spellbook. As they seek to retrieve lost things and possibly make things right, it seems they may also unleash other secrets; secrets nobody ever wanted to know. This is stunning, suspenseful, edgy and atmospheric writing. Creepy in the best possible way. So there's a few more for you. Keep watching this space. There are more to come! "There's talk of how children should be reading, but if you can get a child excited about it that's half the work done." Indeed. A child who learns to approach reading, not as a chore, work or a lesson that must be learned, but rather as a joy, a window to the world, a map to places and people and things...this child will suddenly open up a far easier route to education and to life in general. But I am rambling now. 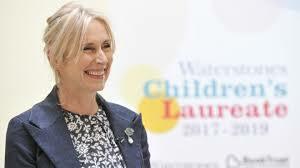 Lauren Child speaks of creativity; of inspiration. And she does not limit these notions to herself and the few others who venture into a career path that leads them down an artistic course. She doesn't like seeing any childs' ideas compartmentalised and limited; that creativity should be encouraged in everyone. And her own creative impulses, along with a lot of hard work, have brought the world some of the most exciting, free and imaginative books in childrens' fiction today...books that, may well be in the land of fiction, but they think like children think; they speak like children speak; and they go on the journeys that children would love to take. 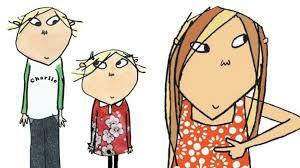 The Charlie and Lola series for young readers is such fun and gives genuine voice to childrens' daily lives. Clarice Bean is a wonderful realistic character. 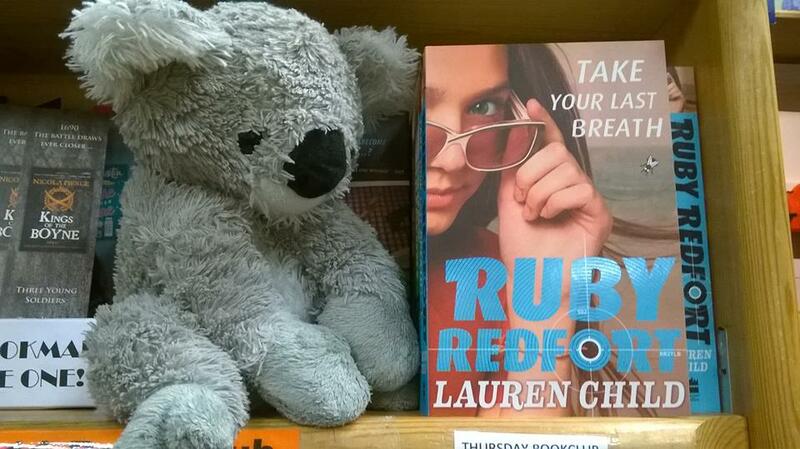 And the Ruby Redfort book series provides daring, excitement and drama (along with that bit of humour). (Both of my kids book clubs are really into the Ruby Redfort books. And if you think its' just a 'girls' book series, it's the boys that ask about them most often. They love them!) Her illustration work is filled with a marvelous, and given the way she works with collage and textile work woven into the picture, sometimes quite literal world-building that is rich, bright and fun. The next two years will be very busy for Lauren Child. And I am excited to see the kind of ideas and discussion her tenure as Childrens Laureate brings to the table. 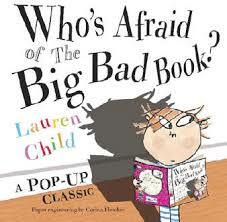 Congratulations to Lauren Child! An outstanding choice. Now...I have to immerse myself in Ruby Redfort. There is going to be a lively discussion at the next meeting that will keep me on my toes! 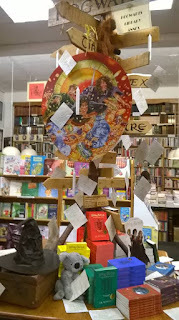 Looking For Books For The Summer? It's June and it's time to plan for the summer holidays...so it's also time to plan some summer reading for the kids. Summer is perfect to help foster the idea of reading for pleasure...because you want to; and to find those all important books that inspire young people into a life of reading. So often I hear, "Oh, they're not into reading and I'd like to get them interested." My response is always "They haven't found their book, yet." And that's just it...there is always one book that inspires, that excites and that ignites a real joy of books in a child. Hopefully, one of these will do just that. 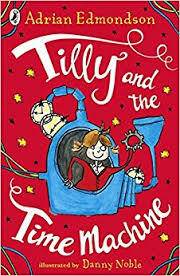 TILLY AND THE TIME-MACHINE by Adrian Edmonson: When Tilly's Dad builds a time-machine in the shed out back, she is shocked to discover it actually works. But Dad is now stuck in the past, leaving clues behind for Tilly and she must rescue him! A great, exciting read for newly competent readers. 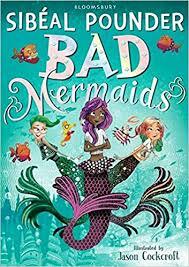 BAD MERMAIDS by Sibéal Pounder: Sibéal Pounder is back this summer with another cracking adventure to follow her Witch War series! Young mermaids Beattie, Mimi and Zelda are enjoying the summer holidays on land with legs. They suddenly receive a telegram (well...a crabagram) telling them they are needed at home immediately. Some very bad mermaids are running riot and the girls are the only ones who can stop them. With fun newspaper articles and black and white illustrations peppered throughout, this is a great story that will appeal to 8-11 year olds or anyone who loves mermaids. 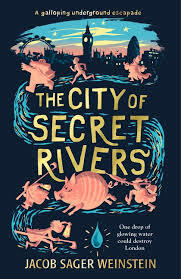 THE CITY OF SECRET RIVERS by Jacob Sager Weinstein: Hyacinth Hayward has recently moved to London with her eccentric mother. One day, her mother disappears and Hyacinth accidentally unleashes the magic flowing through Londons' underground rivers, setting in motion a chaotic chain of events. As she seeks her kidnapped mother, Hyacinth is pursued by the Saltpetre Men and a gang of Toshers and an Oaraboarus,a giant pig in a swimsuit. She races against the clock to free her mother and save the city. 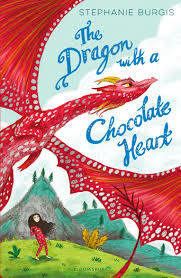 Raucous, hilarious and so much fun.This is the first in a middle-grade fantasy trilogy. So, there's ten for you to consider. Of course there are many more, so watch this space!